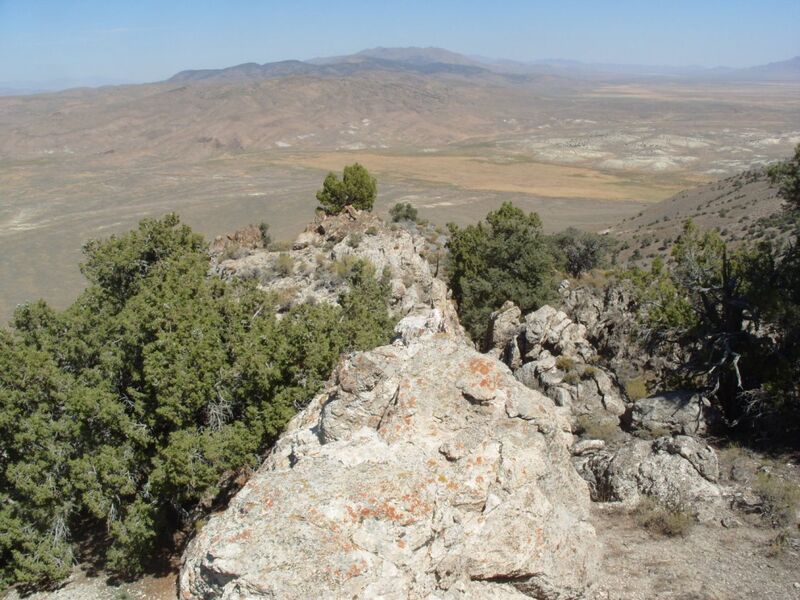 Industrial mineral/base-metal project acquired by US subsidiary SR Minerals Inc.
10 claims staked to cover large surface area of high purity limestone. Potential for use in higher-value industrial applications. Favourably located adjacent to sealed highway and amenable to open-pit mining. Claims also cover prospector-scale mine workings with grab sampling results up to 15.8% zinc. The Company has staked 10 mining claims over an area containing high purity limestone. The deposit is located adjacent to a sealed highway and 55 miles from sidings on the Union Pacific Railroad. There is no public record that this limestone occurrence has previously been targeted for industrial evaluation. The Company’s initial reconnaissance of this area was motivated by an examination of small-scale mine workings for gold mineralisation in a geologically complex area where an uplifted fault block (“horst”) of so called “lower plate” limestone occurs in a setting favourable for the occurrence of intrusion related precious metal, skarn and Carlin-style gold mineralisation. The limestone deposit forms a prominent ridge and lends itself to low-cost open-cast mining with potentially large tonnages evidenced by a large exposed surface area (5.4 sq. km.). The uplifted limestone is metamorphosed and recrystallised suggesting proximity to an underlying intrusive rock. Metamorphism can be an important process in the formation of high purity limestone deposits where high temperatures can bleach and recrystallise the rock and disperse impurities. High purity limestones may have a higher value than those used in construction aggregates and are used, for example, in the chemical industries, in glass manufacturing, flue gas desulphurisation and in various fillers and extenders in the rubber, sealants, plastic and paper industries. It is also used in the manufacture of lime (calcium oxide, CaO) which is used extensively in the mining industry. The field recognition of high purity limestone was confirmed by three reconnaissance samples which returned the following analytical results. These analyses include samples from two areas that can be classified by calcium carbonate (CaCO3) content as very high grade limestone. Preliminary samples include limestone low in iron and silica suggesting that the limestone could meet the specifications of a wide range of higher value industrial applications if these surface samples prove to be representative of sufficiently large areas of the deposit. The Company’s grab samples of mineralised material from old workings have shown high zinc values in material with results up to 15.8% zinc in the form of white oxidised zinc minerals. Such minerals are difficult to identify in field samples of the pale limestones and were not expected. Further work is required to evaluate the economic significance of these results. The first stage in the evaluation of the Ridge Limestone Project will include more systematic mapping and surface sampling and brightness testing to evaluate the suitability of the limestone for higher value industrial applications.